Why the author chose it: I chose this extract to give readers a sense of Faye’s magical shop in her home Scottish village, and how her magic compares to the witches portrayed in a TV show her friend is acting in. I was playing with contemporary ideas of witches in film and TV and how they’re often (though not always) a bit stuck in the past. Mistress of Magic was glass-fronted and cheery; Faye often garlanded the window with seasonal flowers and plants, celebrating the year as it passed along. Inside, the old hearth was still there, and customers liked to settle themselves in one of the two flowery easy chairs beside it to read or, often, have a cup of tea with Faye and have their cards read. Faye made and sold her own loose incense and magical tea blends, packaged in shining jars; she sold tarot cards and crystal wands, books, home-made candles and other witchy supplies to locals and tourists. The set for the TV show that her best friend, Annie, had left Abercolme for – the one she’d begged Faye to come and visit – was nothing like that. The walls were painted black, and reversed silver pentagrams shone dully from nails. From behind the camera, where an assistant had told her to sit until they’d finished the day’s filming, Faye could see that the pentagrams were quite light and blew around in the lightest breeze; she thought they were probably made from plastic tubing, painted dull silver. The set featured a shop counter, rather more baroque than her own, atop which various human and animal skulls sat. Faye wondered if they were real or fake. Animal skulls were easy enough to find if you knew where to look, especially in the countryside, though London was far too noisy and overpopulated for the quiet ways of the land. Faye had a goat skull in the shop, on top of the mantelpiece over the hearth, which had been there since her grandmother’s day and perhaps before. The Morgans – she, her mother Moddie and her grandmother – had called it an Gobhar, sea goat. It had the long horns of the goats that ranged freely on the rocky shores of Arran, and all of the Morgans had rubbed it on the nose for good luck at some point in their lives. When Faye was a child she’d asked Moddie why do we have a goat’s skull on the mantelpiece, none of my friends at school have one, and Moddie had said more fool them. There were shelves of books on the set, but their spines were painted with bright white and gold symbols in the way that no real books were – no doubt, to make them look like ancient grimoires and recognisable as ‘black magic’ to the TV audience. Faye allowed herself a smile. Her grandmother’s grimoire was a green leather-bound notebook, foxed and aged, full of Grandmother’s faded, spidery writing. No upside-down pentagrams there; indeed, as well as old spells and Grandmother’s record of the success or otherwise of her spellwork, there were jam recipes and snippets of village gossip. Tarot cards relating to the book! These two cards (taken from The Tarot of the Sidhe by Emily Carding) show the sexual illusion and fantasy that Finn Beatha inspires in Faye Morgan, and he himself as the Dancer King. 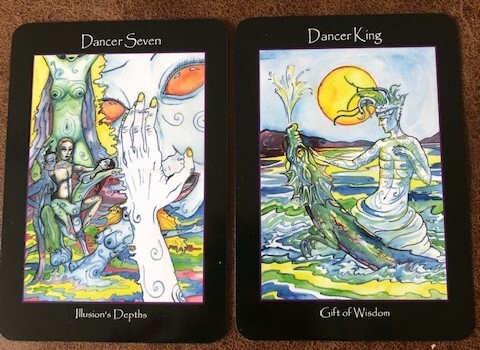 I think that the Dancer suit refers to the element of water, which represents our emotional life. Faye is drawn to Finn as a lover but also as someone who matches the faerie part of herself, a part that she’s still becoming accustomed to. When she’s with him, it’s like he and the kingdom of Murias cast a spell over her and she loses herself. There is a great danger for Faye in being involved with faerie but there is also a sense of belonging there too, and of finding herself, if she can only find the right path forward. Yet, Finn is still a wise faerie king, an elemental being in his own right, with great power. Knowing Finn has lent Faye a certain kind of wisdom about how the kingdom of Murias operates and she continues to learn about her own power from him.